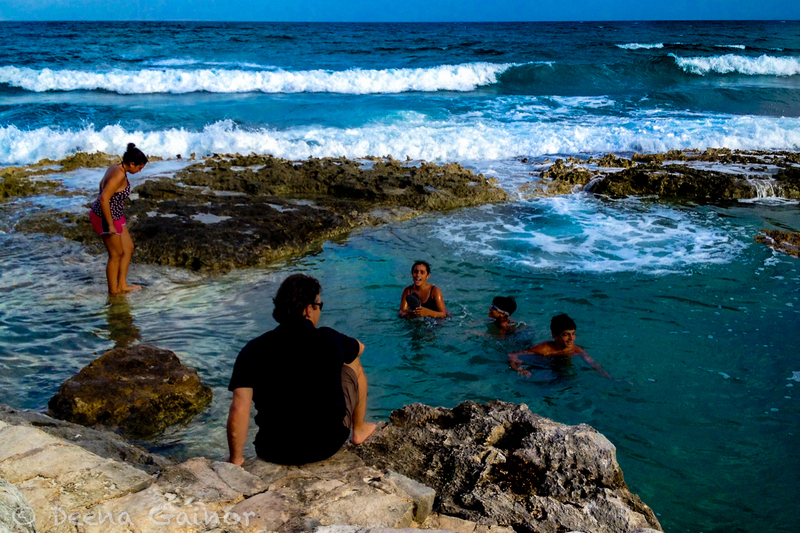 We spent several hours exploring every nook and cranny of this spectacular stretch of coastline in Puerta Aventuras. Tide pools and craggy coral rock formations were mesmerizing and I could hardly put my camera down. The kids were equally absorbed in their explorations, diving into the natural pool, navigating the rocky coral, and discovering all sorts of new creatures. 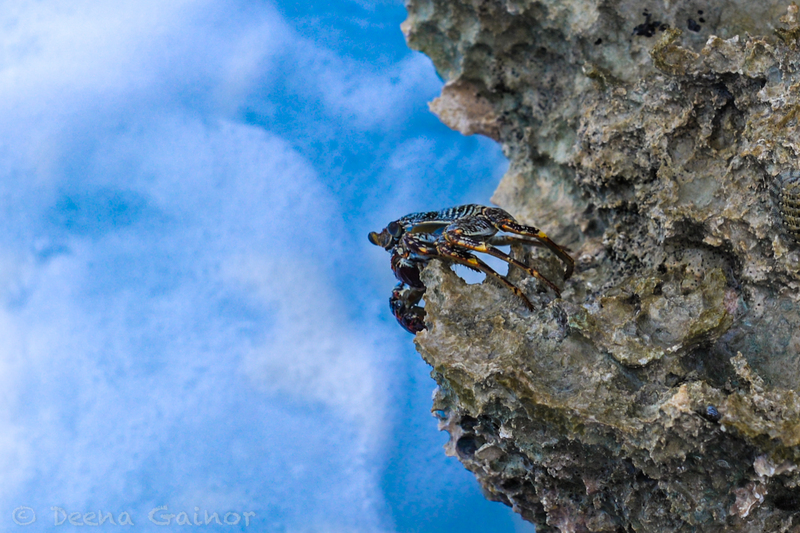 We found this colorful crab bathing in a tide pool before scurrying away from us, looking for protection. He was gracious enough to let me photograph him for a few moments, but his kindness was short-lived. As I photographed him, the sky grew darker, the waves became rougher. Our new friend darted away, hiding in the cleft of the rocks, safe for now. I was surprised by how quickly he could move. Maybe we should have done the same? I turned my attention to the kids. 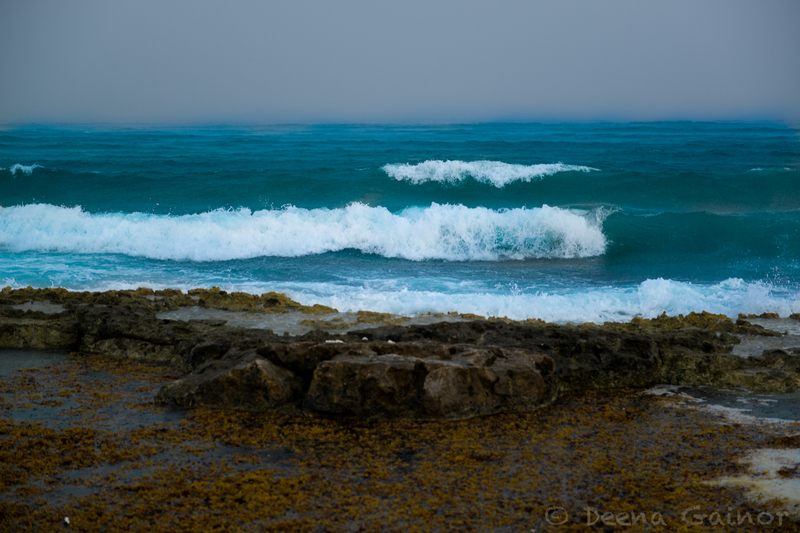 They were on the outer edge of the natural pool scaling the wall as the angry waves started to pound past them. I don’t think they realized the potential dangers. I must admit, it made me nervous to see them perched so precariously on the craggy shoreline as the waves pushed past them. 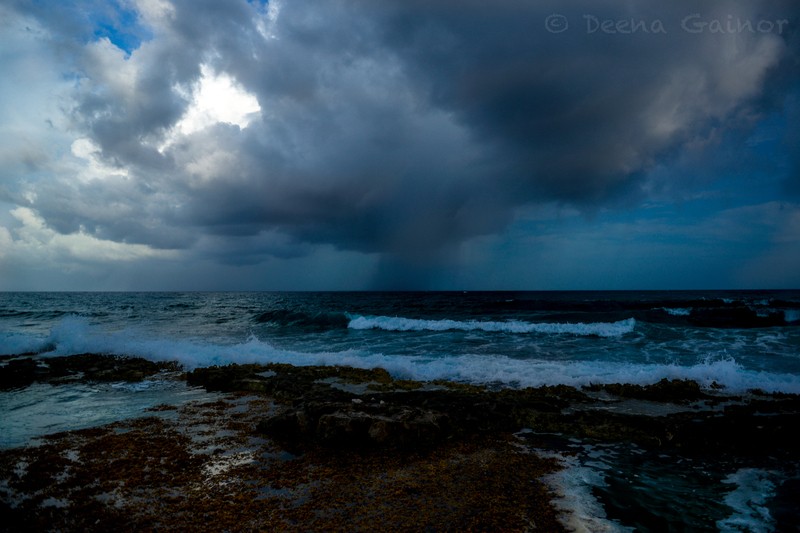 As we gathered them close, the sky opened up and torrential rains poured down, drenching us in seconds. Strong winds whipped through nearby palm trees. We should have made a run for it, but it was way too beautiful. Since there was no lighting, we found shelter under a tiny palapa and begin to shoot the amazing scene displayed before us. But how do you capture this kind of beauty, or the rugged force of the crashing waves? We were surrounded by sheer glory, God’s glory. It was powerful. It was intense. And I was in awe. In preparation for our journey, we have often prayed that God would show us His glory, make Himself real to us. And He has done it, time and time again. How can we gaze upon the sea here in Playa, with its multiple shades of turquoise, green, and blue and not see Him there? Is it possible to explore the depths of the ocean, with its myriad of creatures, and not be overwhelmed with His creativity? Our snorkeling adventures have confirmed this time and time again. But how extraordinary is it to be in the midst of a raging tempest, sensing the strength and fury enveloping us, and yet feeling utterly sheltered, unscathed, protected? Like our friend, the crab, wisely seeking shelter in the cleft of the rock, so we also felt impenetrable, even in the midst of such turbulent weather.